Rocklin Lions Pack 29 - What is Cub Scouting? Cub Scouting is fun! No matter what grade you are in, from just graduated from Kindergarten through fifth grade, it can be a blast. Do you like to learn by doing? This is just the place. You can learn to tie knots, set up a tent, shoot a bow and arrow (archery). Have you ever cooked a meal on a campfire? Sent a secret code to a buddy? build a bird house? Play Ultimate? Hike? Earn rewards for doing these things in Cub Scouts. As a Cub Scout you will be part of your own pack. The pack is divided into smaller groups called dens. Each den has about six to eight boys. All of the Cub Scouts in your den are in the same grade and may even go to the same school. 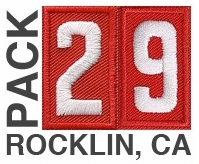 Our Cub Scout pack is chartered by the Lions Club of Rocklin. Have you been to the local Police Station and talked to the policeman on duty? Or visited the Fire Station and sat in the drivers seat of the ladder truck? Or visited the local television station and sat in the news anchors chair? These are some of the places you might go with your den or pack. You might also: Build a Pinewood Derby car and race it on the track, build a sail boat or trimaran and race it in the rain gutter regatta or build a space ship and race it to the stars in the pack space derby.